Nurse call systems is a designed system which is an electrically operated system which enables the patient to summon a nurse from a duty station or a bedside station. It offers high productivity and quality of nursing services, which employ relatively new and inexperienced nurses and it proves crucial in providing quality health services by automatically managing the nursing tasks and activities. The global Nurse Call Systems (NCS) market is anticipated to $16.026 billion by 2023 growing at an estimated value of CAGR of more than 6.6% during the forecast period 2018 to 2023. The significant increase in the need for efficient and responsive health care communication between patient ad nurse, increasing budget allocation for health care of elderly population, and growing patient population, among others are anticipated to contribute to the significant growth of the market during the forecast period. North America is dominating the Nurse Call Systems (NCS) Market, with a share of $4.353 billion in 2017 at a CAGR of 5.80%, and is projected to reach $6.105 billion by 2023. The presence of large number of hospitals and healthcare facility centers is the biggest driving factor for traditional nurse call systems market in this region. 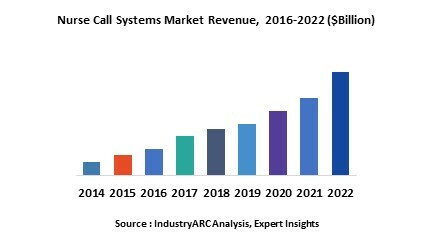 Nurse Call System Market is segmented on the basis of type, Technology, equipment, application and end user. On the basis of type, the NCS market is segmented in to Traditional NCS, Advanced NCS, Middleware Interfaced NCS and others. Traditional NCS is having highest market share in 2017 which is valued at $4676.6 million and it is expected to grow at a CAGR of more than 3.2% during the forecast period 2018 to 2023. On the basis of Technology, the NCS market is bifurcated in to Wired and Wireless NCSs. The wired NCS segment accounted for the highest market share in the previous years and the wireless NCS is expected to grow at the highest growth rate during the forecast period to rapid digitalization. The growth of the Wireless NCS market is attributed to the increase in preference toward wireless NCS as they allow free mobility to patients. On the basis of equipment, The NCS market is segmented in to Button System, Intercom System, Mobile System, Integrated Communication System, Basic Audio/Visual Alarms and others. The Integrated communication system segment accounted for the highest market share globally. On the basis of application, the NCS market is categorized in to emergency medical alarms, wanderer control, workflow support, and others. The emergency medical alarm segment is expected to account for the largest share of the market during the forecast period and the growth in this segment is driven by new product launches. The NCS market is segmented based on end user are Hospitals, Ambulatory Surgical Centers, Clinics, and Medical Assisted Living Centers, Nursing Homes, Out Patient Departments and others. Hospitals and clinics held the majority of the market share and growing number of patients and rising urgency of medical care together leads to nurse fatigue. Hence hospitals and medical care centers are increasingly adopting Nurse Call systems. Some of the key drivers which propel the growth for the Nurse Call System market is the rising in healthcare expenses, especially in the developed nations, increasing popularity of medical insurance in various developing economies, increase in old age people over the world, prevalence of chronic diseases, high increasing investment in healthcare industry, government bolster for many technological innovations that helps in consumer’s care progressively. The other few challenges faced by the Nurse Call System Market is increasing patient numbers in the face of rising operational costs and tight budgets, pertaining to integration and interoperability, lack of skilled professionals who can function efficiently with healthcare as well as IT which are surging the market for NCS from attaining its true potential. The Stringent rules and regulations across the world concerning ambiguities associated with the environment is one of the significant challenges experienced by Nurse Call System market. The base year of the study is 2017, with forecast done up to 2023. The study presents a thorough analysis of the competitive landscape, taking into account the market shares of the leading companies. It also provides information on unit shipments. These provide the key market participants with the necessary business intelligence and help them understand the future of the Nurse Call System Market. The assessment includes the forecast, an overview of the competitive structure, the market shares of the competitors, as well as the market trends, market demands, market drivers, market challenges, and product analysis. The market drivers and restraints have been assessed to fathom their impact over the forecast period. This report further identifies the key opportunities for growth while also detailing the key challenges and possible threats. The key areas of focus include the types of plastics in the electric vehicle market, and their specific applications in different types of vehicles. Nurse Call System Market– By Type: Traditional NCS, Advanced NCS, Middleware Interfaced NCS and others. Nurse Call System Market – By Technology: Wired System. Wireless System. Nurse Call System Market - By Equipment: Button System, Intercom System, Mobile System, Integrated Communication System, Basic Audio/Visual NCS, Digital NCS, Central Console, Room Stations, Hallway Communication System, Corridor or Intermediate Station Lights and others. Nurse Call System Market– By End user: Hospitals, Ambulatory Surgical Centers, Clinics, Medical Assisted Living Centers, Nursing Homes, Out Patient Departments and others. Some of the Key players in this market that have been studied for this report include Hill-Rom Holdings Inc, Tyco SimplexGrinnell LP, Ascom Holding AG, Honeywell International, Inc, Rauland-Borg Corporation among many more. Many companies are increasing investments towards various healthcare IT systems has led to the trend of adopting advanced art communication systems in hospitals. Healthcare facilities have been increasingly focusing on building efficient communication infrastructure in order to provide enhanced clinical workflow integration to their patients. Furthermore, with the upcoming technological advancements in the IT and communication systems, the nurse call systems market is anticipated to continue witnessing strong growth in the further years. The Nurse Call Systems market has been witnessing a price declining trend for different communication equipment used in the overall nurse call systems thereby, resulting in a higher rate of adoption in various developing markets. In August 2017, Wandsworth Healthcare launched latest IP nurse call system – IPiN Evolution has moved the IP to the bed offering on again, by utilizing the latest hardware and software. Complementing this new system is the futuristic nurse call handset that has set a new standard in what Trusts and Patients should expect from their handset. February 7, 2017 – AMETEK, Inc. (NYSE: AME) today announced that it has completed the acquisition of Rauland-Borg Corporation, a leading global provider of mission critical communication solutions for hospitals, healthcare systems and educational facilities. Researchers from the department of biomedical engineering, SRM University, India have developed a new low cost automated nurse call system for improving patient care using Laboratory Virtual Instrument Engineering Workbench (LabVIEW) and National Instruments MyRIO. It could help in improving patient care at hospitals where centralized monitoring system is absent. This cost of implementing this system is the major advantage as this system can monitor up to 10 beds at a time. Since this system uses NI LabVIEW, the user interface is very friendly which is also customizable based on patients’ medical history. In future, a messaging system can also be incorporated wherein an alert message is sent directly to the mobile phone of the consulting physician along with the type of arrhythmia condition. The proposed system can also be used for monitoring of epileptic patients using the EEG signal, thereby ensuring continuous monitoring of both heart disease and epileptic patients.